The Havelock Guest AccommodationMinimum age 5 years. 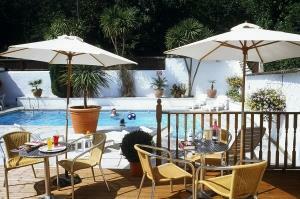 The Havelock was originally built a gentleman's residence and is set in mature gardens overlooking the sea. We offer 22 en-suite bedrooms, including 2 balcony rooms, 6 rooms with king size beds and 10 of the rooms also have sea views. Our prices offer great value for money and we aim to give a personal service to all guests. Why not relax on the terrace, in the lounge/bar, or by the heated swimming pool (open from mid-May to mid-September - weather permitting), whilst enjoying a drink or a light snack during the day. We are only a short stroll from Shanklin Old Village or the seafront, where you can enjoy a fantastic selection of foods that the many restaurants, pubs and cafe's have to offer. A non-smoking establishment (ashtrays on terraces). * Spring & autumn special breaks. * Car ferry inclusive available. 4* Bed & Breakfast located centrally in Shanklin overlooking the sea with heated outdoor swimming pool, perfect for short breaks. Cycle storage available. Children welcome from age 7. The Havelock sometimes limits bookings to 10 or more days. Rooms 12, 17 and 18. Double en-suite sometimes limits bookings to 10 or more days. From East Cowes ferry, second exit at roundabout onto Well Road, A3021, A3054 to Newport, A3020 to Sandown, A3020 to Shanklin. From Fishbourne ferry, B3339 (Fishbourne lane), A3054 to Ryde (Esplanade), straight along the Esplanade to the boating lake, follow the road round to the right onto A3055 to Sandown, A3055 to Shanklin. Excellent accommodation, breakfast was superb. Location was good.